The Brothers of the Christian Schools, San Francisco New Orleans District (SFNO) hosted the Brothers in Initial Formation Retreat November 8-11, 2018 at Saint Joseph’s Camp on the Russian River in Duncans Mills, California. From across the United States, the Brothers in initial formation who participated were Brothers Steven Angulo, Ryan Anderson, Paul Avvento, Steven Barbaro, David Deradoorian, Johnathon Emmanuelson, Mark Engelmeyer, Javier Hansen, Matt Kotek, J.D. Macioce, Patrick Martin, Kyle Mena, Dylan Perry, and Rafael Rodriguez. Also in attendance were the Brothers’ Directors of Formation for each District: Brother Tom Johnson, FSC (Midwest District), Brother Rich Galvin, FSC (District of Eastern North America), and Brother James Joost, FSC (SFNO). Brother David Caretti, FSC and Cyndi Stanfield of SFNO were the Lasallian celebrity chefs for the gathering. Father LaSalle Hallissey, OP from De La Salle High School in Concord, California was chaplain for the gathering. The retreat theme was “Being Brother in the Young Church Today” and was facilitated by Charles Legendre, AFSC, SFNO Director of Evangelization and Catechesis. Focused on the particular role of the Brother in today’s changing religious landscape, the retreat was organized into three movements: examining three models of faith development by James and Evelyn Whitehead, Ronald Rolheiser, and James Fowler; exploring the religious faith and spiritual practices of young people today through the Brothers’ experience with their own students, “Lasallian Reflection 2: One Call, Many Voices,” and the Saint Mary’s Press study, Going, Going, Gone; and considering ways of listening and dialogue as effective responses to the spiritual needs of young people today. Participants also heard from Brother James in a host-District history segment on SFNO’s various District formation and religious education programs, including Campus Ministry, Religious Studies Assessment, and the Lasallian Catholic Assessment Process (LCAP). The gathering also provided its participants with ample opportunities for prayer, reflection, and fraternal dialogue. Evening socials rounded out the day’s activities with time for catching up, simple relaxation, and continued sharing of the thoughts and insights that had been generated in their work sessions. According to Brother James, the bi-annual Regional Brothers in Initial Formation Retreats were first held in the fall of 2004. Attendees are Postulants, Novices, Temporary Professed Brothers, and Formation Directors from the District of Eastern North America, the Midwest District, and the District of San Francisco New Orleans. The three Districts jointly sponsor the gatherings and also alternate serving as their hosts. 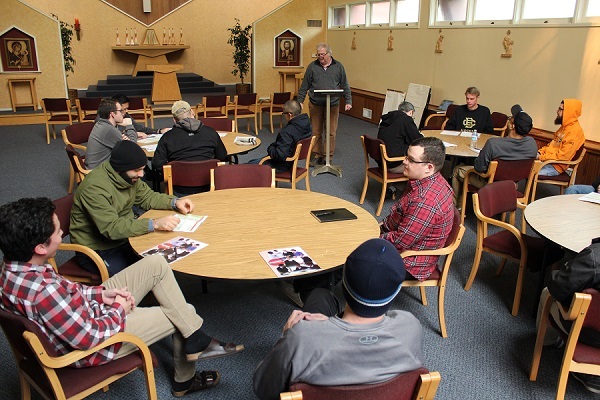 The purpose of the Initial Formation Retreats is to develop among those Brothers fraternal and social support, provide input and education on topics central to their personal and professional growth, and encouraging ongoing dialogue and processing around their experiences. This accompaniment serves the Brothers in initial formation as they deepen their vocation as De La Salle Christian Brothers in the Church, called to live the Gospel faithfully and creatively in today’s world as men of faith, community, and service. Shared from the District of San Francisco New Orleans. All photos courtesy Brother James Joost, FSC.